The minxes were indignant at the prospect of missing the huge secret party that all adults enjoy at New Year. “But if you don’t wake us up for midnight, then we’ll miss the Footsteps!” wailed a very upset Midi. Well, they won’t be doing that either! But like a pair of idiot parents, me and The Boss have agreed to wake them before midnight so they can join us in some (more) party food, a slice of black bun that I baked today, and some fizzy drinks (lemonade for minxes, Prosecco for us auld farts). I guess their 3 months of Highland Dancing lessons are about to come in handy. And yes, I know I’ll regret it tomorrow when we’re all fractious and over-tired, but hey ho, there’s got to be a first time for everything. I know it’s traditional to look back and forward at this time of year, count your blessings, list your dreams, that kind of thing. And don’t get me wrong, Family Trout has had a lovely 2014, with exciting bits, busy bits, and frantically worrying bits, just like most families. We’re optimistic and hopeful about 2015. But right now I’m mostly thinking about friends who’re dreading 2015 for different, sad reasons. I wish I could take a big chunk of Hope, dunk it in a bowl of Joy and roll it in layer upon layer of Love until it’s indestructible, then gift it to each of those friends. Ah, if only! as daftly fun as The Boss blowing bubbles in the snow at midnight, and as hopeful as Midi waiting to hear if Santa had her on his Nice List (he did). It’s Boxing Day as I write this, and already I’ve admitted to the kids that I miss getting up early every morning to discover what mischief the elves have gotten up to. 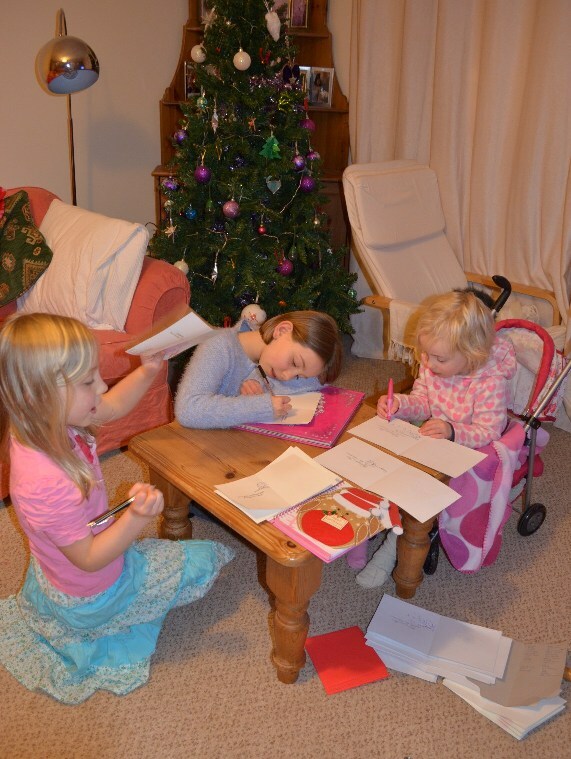 They left a note on Christmas Day when Santa picked them up, thanking the girls for such a great month, and promising to be naughty all year so that Santa would send them back. Here are the last few days of their shenanigans. 23 Dec: So on Christmas Eve, the minxes woke up to find their My Little Ponies turned into reindeer to pull the first load of chocolate for them. Despite having them out on the mantelpiece ready to write since 1 Dec, I’ve been putting off writing Christmas cards all month. Normally I really enjoy sitting for a couple of evenings, thinking about each of my friends and family in turn as I write a few words to them in a daft wee card. Not this year. I’ve been wondering why. The best I can come up with (other than that I am obviously a lazy nightmare of a person) is that writing to a friend I’ve not seen all year makes me feel wistful and melancholy. Writing to a family who have one less person to mark the New Year with than they had last year is just heart-breaking. Next year I’m going to buy a village a goat in lieu of buying and sending any Christmas cards. The Boss voted for the village we live in. I out-voted him. The last few Elf Nights have all been down to The Boss’s genius. I think he loves December more than the minxes! Now, had it been me organising it, I think both Barbies would have been tortured, dismembered and generally trashed. But it wasn’t, and The Boss’s sense of fair play is far stronger than mine. 14 Dec: New Barbie threatened by Edwinn. Old Tattie Barbie is cheering in the background while Edward hides? Cries? Like last year, and the year before that, I’m enjoying a whole 24 uninterrupted mornings of the girls leaping out of bed the instant they wake (early! ), with big excited smiles on their faces. Magical! I’m also hugely entertained and charmed at the way all 3 minxes catch sight of the elves and immediately discuss and agree a back-story. Example, after the last scenario, they decided that Edwinn wants to run away to join the circus and that Edward is scared of heights; therefore Edwinn must have been trying to persuade her cousin to run away with her. And she’s already checked their heights and worked out a route to the circus (by boat. With knitting needle and playdough sails). 5 Dec: who needs botch tape when you have lolly sticks and pipe cleaners? 6 Dec: Sailing away on a bath mat in the bath, surrounded by jelly sweeties in the shape of fish and starfish. The Boss made the mat rippled like waves. I think I’m the only one who noticed and thought it was clever! 7 Dec: pair of trapeze artistes. Yes, Edward is holding on with his little swirly hat. 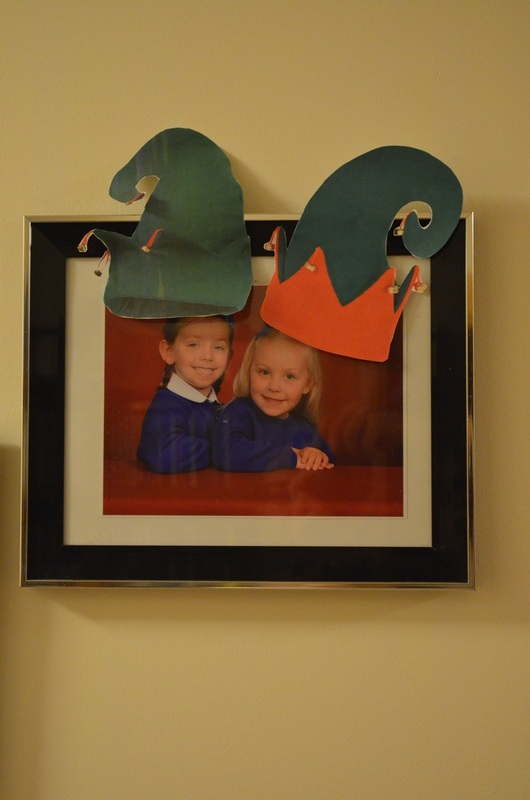 As predicted, the first night the elves visited us, they were on their very best behaviour: partly because we’ve run out of Nutella and partly because me and The Boss don’t want to peak too soon… So last night they only used up 2 bits of paper and the last of my coloured printer ink. Though the minxes needed some prompting to notice anything other than that Barbie was sitting in Edwinn’s lap with her hat on, and Edward was leaning out, keeping lookout. I dunno, maybe in their little world everyone cuts about with over-sized elf hats on! (Or maybe it’s only me who looks at their school photos fondly every day). Hullo! Until Ah fix yer windscreen, dinna look at it… Dinna even blink! Or ye’re deid!! 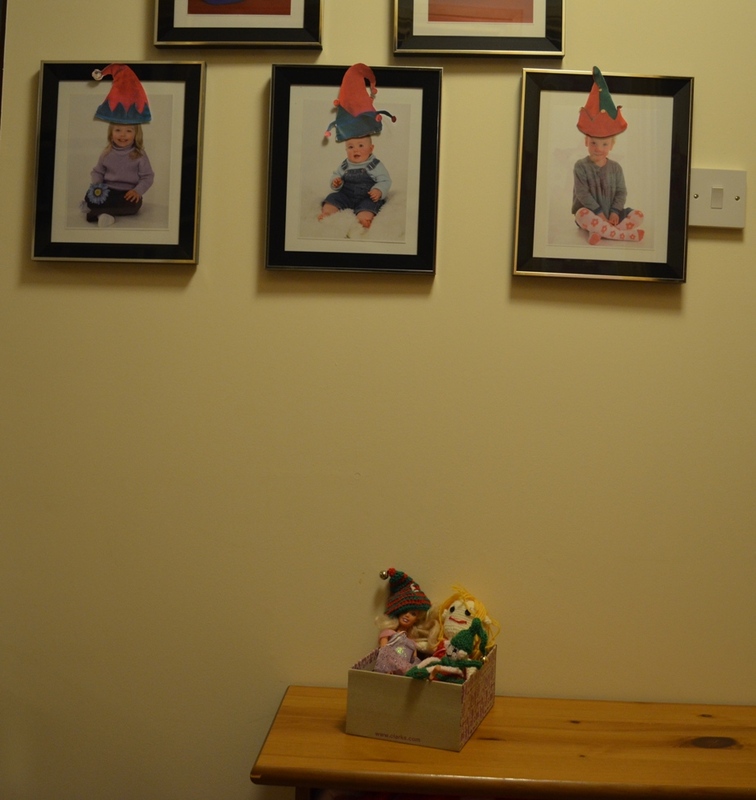 It’s 1 December, so in the Trout Household that can mean only one thing: the elves have come back! The minxes have been more excited about the return of the elves than they are about Christmas. They’ve been counting down the days till the end of November and continuously begging me to email Santa to say I’ve changed my mind about not wanting the elves to come back. I’ve been playing my part all year long, telling them that Santa promised me that they’d never come back. In reality, of course, I’ve been counting the days, too! I made sure that all my classes finished in November so that I have the whole of this month free to enjoy with the kids, plotting mischievous elf stuff – yippee! So, how did they make their big appearance? Well, as luck would have it, I was minding a wee girl for a few hours. She and Mini Minx tucked up in front of Frozen, singing their little hearts out, while I nipped outside for 60 seconds. I left the elves in a shoebox by the side of the house with a letter from Santa. No-one ever goes there except Midi and Mini, who like to hide there on the way home from school. After school I had a few errands to run. The girls missed their Highland Dance class because my car’s off the road*, so I let them choose a chocolate bar each. They dawdled home in the cold and the drizzle, reminded me again that we were the ‘only’ house in the street with no Christmas decorations up, and strolled to the front door. All except Midi, who walked at a normal pace, straight for the side of the house. Midi let out a blood-curdling shriek that meant she’d either found the shoebox or been murdered gruesomely. Out into the street she hopped, waving a lid with the kids’ initials on it, and my Santa signature. Her sisters crowded her, and they all jumped around, skipping and clapping and cheering, little eyes shining and smiling at each other. That’s why I do this Elf on a Shelf thing: for jewel moments like that. As I type, The Boss is cutting out a load of little elf hats that I copied and printed for tonight. I have a funny feeling that the elves will be behaving themselves for the first few days, to lull us into a false sense of safety. Arghhhh, I love this bit of the year!